We also have new bells! Order from the CORBA Store. 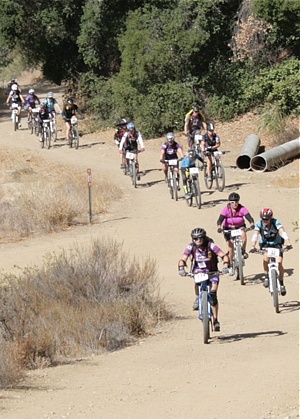 Girlz Gone Riding September News September 2015! It’s been two years since we produced the CORBA 25th Anniversary jersey. We still have a few of those in stock, but it’s time for a new design. 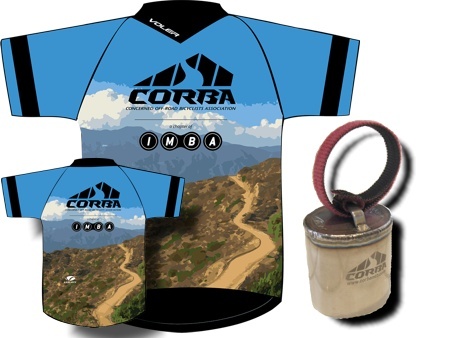 In response to our members’ desire for a more color, we’re proud to announce a new CORBA jersey for 2015. The new jersey features an impressionistic view of our local mountains. These jerseys are of the highest quality, and can be ordered direct from Voler. 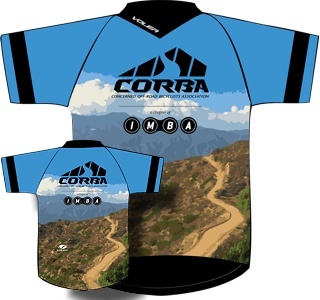 For each jersey ordered CORBA will receive a small commission, supporting our advocacy and trail maintenance efforts. Order yours now! Typical order turnaround time is two weeks. Jerseys are available in men’s and women’s cuts, and feature a comfortable, loose fit, pocketless design. Cost is $65. For orders of $75 or more, shipping is free. 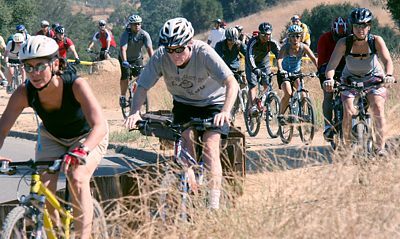 To coincide with the GGR: Girlz Gone Riding annual Rocktober event coming up October 18th at Malibu Creek State Park, GGR is partnering up with CORBA for a CORBA/IMBA membership drive! All GGR club members that renew or purchase a new CORBA/IMBA membership will be entered into a prize drawing to win a new CORBA jersey, an REI Tent and other goodies to be awarded at the Rocktober event in the afternoon. All NON GGR members who renew their CORBA membership, including men, will be eligible for a CORBA jersey. There will be one jersey each for a male and female/GGR renewing member. Saturday, October 17, 2015: COSCA Annual Trailwork Day. We'll be buiding another new trail, this one in Conejo Canyons, climbing from the end of the 'new' bridge and connecting to the very new trail that leads to the top of Elliott Peak. This will enable a number of intereting loop routes. For full details and to register, see our Meetup event and registration page. Saturday, October 31, 2015: Backbone Trail between Mulholland and Etz Meloy. This will be our third visit to this segment of the Backbone Trail in the past year. 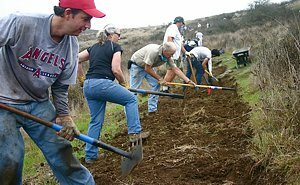 With enough volunteers, we'll finish cutting the overgrowning brush back and improve the drainage before the El Nino rains wash it away. For full details and to register, see our Meetup event and registration page. We are most excited that this year we will have over 100 demo bikes! Liv, Trek, Specialized, Bulls Bikes USA, Turner and Rocky Mountain will all be there with their demo fleets! Reservations are required. The reservation list and contact to reserve the demo bikes will be posted in the next few weeks. In keeping tradition, a special COMMUNITY award will be given out this year to the bike shop that shows the most community involvement with women’s cycling. The winner has been chosen and will be announced at the morning commencement at the Rocktober event. Saturday September 5th is the next skills clinic.